The AfroCentric Health group donated 17 scooters to the department of health on 18 November to help in the fight against Ebola in West Africa. The scooters were donated in aid of the department's Ebola Response Fund. 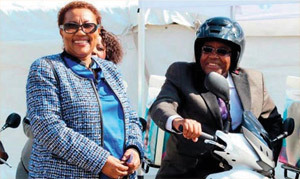 Dr Anna Mokgokong, chairperson of AfroCentric Health and Dr Aaron Motsoaledi, Minister of Health, with one of the scooters.